*Editor’s note: The Indiana Chamber of Commerce proudly supports Indiana men and women serving in the military. This blog originally appeared here. As citizens of Greenwood go about their daily lives, members of the U.S. Navy’s “Silent Service” work beneath the ocean’s waves, continuing a tradition that only a small fraction of military members will ever know: strategic deterrence. 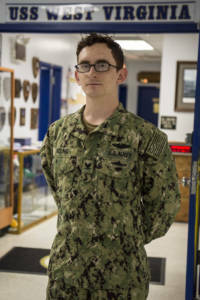 Petty Officer 3rd Class Jordan Boling assigned to USS West Virginia hails from Greenwood, Indiana, and is a 2012 graduate of Greenwood High School, takes on the task to execute one of the Defense Department’s most important mission of strategic deterrence. Boling is a culinary specialist stationed at the Naval Submarine Base Kings Bay, homeport to the Ohio-class ballistic-missile and guided-missile submarines. “I provide the crew with food and customer service, I am also medical assistant to the doctor,” Boling said. Boling credits continued success in the Navy to many of the lessons learned in Greenwood. “Leadership and perseverance is what I apply to my Navy career,” Boling said. The Navy’s ballistic-missile submarines (SSBNs), often referred to as “boomers,” serve as a strategic deterrent by providing an undetectable platform for submarine-launched ballistic missiles, according to Jablon. They are designed specifically for stealth, extended patrols and the precise delivery of missiles if directed by the President. The Ohio-class design allows the submarines to operate for 15 or more years between major overhauls. On average, the submarines spend 77 days at sea followed by 35 days in-port for maintenance. Boling is part of the boat’s Gold crew, one of the two rotating crews, which allow the boat to be deployed on missions more often without taxing one crew too much. A typical crew on this submarine is approximately 150 officers and enlisted sailors. The first submarine was invented by Yale graduate, David Bushnell, in 1775 and provided the colonists with a secret weapon in the form of a one-man wooden craft in an experimental submarine that was nicknamed the Turtle. U.S. submarines may not be what some have imagined. Measuring 560 feet long, 42-feet wide and weighing more than 16,500 tons, a nuclear-powered propulsion system helps push the ship through the water at more than 20 knots (23 mph). Because of the demanding environment aboard submarines, personnel are accepted only after rigorous testing, according to Navy officials. Submariners are some of the most highly-trained and skilled people in the Navy. Regardless of their specialty, everyone has to learn how everything on the ship works and how to respond in emergencies to become “qualified in submarines” and earn the right to wear the coveted gold or silver dolphins on their uniform. “This command is very family oriented so we have the cohesion here,” Boling said. Serving in the Navy means Boling is part of a world that is taking on new importance in America’s focus on rebuilding military readiness, strengthening alliances and reforming business practices in support of the National Defense Strategy. A key element of the Navy the nation needs is tied to the fact that America is a maritime nation, and that the nation’s prosperity is tied to the ability to operate freely on the world’s oceans. More than 70 percent of the Earth’s surface is covered by water; 80 percent of the world’s population lives close to a coast; and 90 percent of all global trade by volume travels by sea. Though there are many ways for sailors to earn distinction in their command, community, and career, Boling is most proud of getting in the Navy at 19 and getting into a leadership position. As a member of one of the U.S. Navy’s most relied upon assets, Boling and other sailors know they are part of a legacy that will last beyond their lifetimes providing the Navy the nation needs. “Serving in the Navy is a jump to the real world it is a great stepping stone,” Boling said.